Nurses in a faraway control room monitor patients and processes with artificial intelligence tools to reduce alert fatigue and free on-premise clinicians to spend more time with patients. At an off-site support building two miles from NewYork-Presbyterian’s Weill Cornell Medical Center, registered nurses use artificial intelligence to monitor what’s happening at the hospital. The space houses various remote administrative stations, including clinical monitoring setups that have computers and six screens from which nurses track real-time physiologic data of patients in the emergency department. RNs also check activity through smart-bed technology, keeps tabs on temperatures of refrigerators that house life-saving medicine, and facilitate call center functions. NewYork-Presbyterian dubbed this AI-infused shop the Clinical Operations Center, or CLOC, and the goal is to leverage artificial intelligence in a 100 percent capacity within the next 12-14 months. CLOC is already is showing the benefits of incorporating artificial intelligence into daily clinical monitoring of patient care in ways that other hospitals can learn from. “We’ve had to innovate and completely reshape traditional methods of healthcare,” said Leo Bodden, NewYork-Presbyterian Hospital’s chief technology officer, who oversees CLOC. CLOC analyzes data to pinpoint areas ripe for improvement, make better decisions, identify efficiencies or progress, centralize distributing services, and identify tasks that can be streamlined using artificial intelligence and other digital tools. “We have successfully been able to lean on highly complex automated systems that greatly decreased redundancy in tasks performed by registered nurses, doctors and other staff, reduced the number of team members physically required to monitor patients, and sizably cut down the amount of time staff spend inputting patient data,” Bodden explained. Within hours after NewYork-Presbyterian established a remote emergency department patient monitoring program, for example, it began identifying cases where patients needed intervention that had been noted locally. A CLOC registered nurse uses the Philips IntelliVue platform combined with NewYork-Presbyterian’s electronic health record to remotely monitor patients, and if needed, direct the team on the floor to clinically intervene to catch or prevent a negative health event. CLOC has helped improve clinical outcomes in some cases. In one instance, a CLOC RN intervened with an elderly patient who presented for weakness. 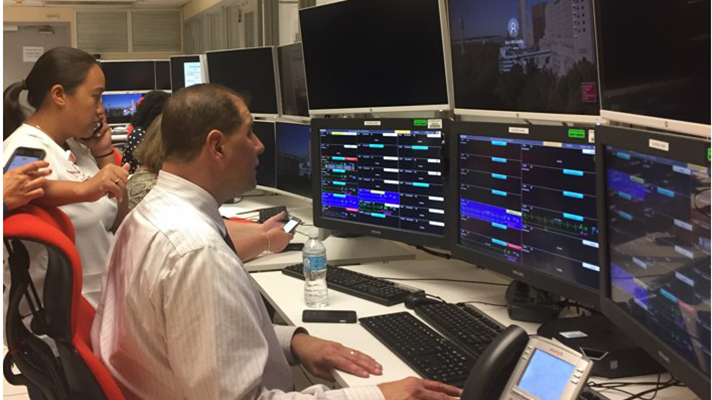 While monitoring remotely, the CLOC team noticed the patient’s heart and respiratory rates were increasing and connected with the emergency department team to make sure the patient was treated and stabilized. Another example: NewYork-Presbyterian modified how it captures patient vitals to offload non-clinical responsibilities and afford clinical staff more time to focus on patients. Since creating CLOC, NewYork-Presbyterian has learned from experience how to take advantage of opportunities that allow it to use automated monitoring of data that previously was collected and monitored manually. CLOC has afforded clinicians access to a comprehensive look at data in real time that’s presented in an actionable format that improves operations, and allows for centralization of tasks that had otherwise been spread over many people, Bodden said. The physiologic monitoring system in the emergency department generates well over 30,000 alarms per week, which used to bog down the clinical teams on the floor – the term is referred to as alarm fatigue because it is so incessant that staff usually end up desensitized. After going live with CLOC, the number of notifications made to emergency department registered nurses via text or call has gone down to around 100 on average. The team on the floor can de-prioritize the 30,000 “nuisance” alarms that are not categorized as a priority. “This is an example in which CLOC has found a way to significantly limit distractions and offload non-clinical tasks for staff, by using systems that step in to filter priority versus non-priority alarms, providing staff with more time in their schedule,” Bodden said. NewYork-Presbyterian believes the future of medicine is virtual. With this in mind, there is definitely a steady interest to continue to invest in digital health, as well as specific technologies that simplify everyday routine tasks.